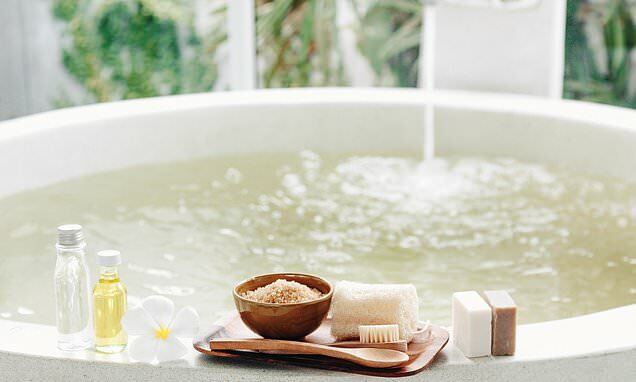 ASK DR ELLIE: Will a magnesium bath really calm my anxiety? I suffer from terrible anxiety. I read that magnesium is helpful for calming a whirring mind. Is this true? If so, do I take it orally or soak in a magnesium salt bath? Magnesium is an important mineral for the body, used to maintain good bone health and extract energy from food. It’s found in leafy vegetables such as kale and spinach, brown rice, dairy products and nuts. It is thought most people will get enough (300mg daily) from dietary intake. Government advice is to be careful of supplementing beyond this level as it may cause digestive prolems in the short term, while the long-term effects of taking too much are still unknown. Expert sources do not recommend magnesium for insomnia or anxiety. However, some supplements are recommended for helping mood and anxiety, including omega 3 fatty acids, selenium, folic acid and tryptophan. But even evidence for these is not enough for doctors to use them instead of treatment. Non-drug methods of controlling anxiety include cutting down caffeine intake from all sources and eating regularly to avoid sugar highs and lows that affect mood. Many people claim that magnesium is better absorbed through the skin as part of a bath, rather than via the gut – Epsom salts are a way of adding a dose to bathwater. But a 2017 scientific review advised that, despite the popularity, there is not enough scientific evidence to support this claim. I have always suffered a sluggish bowel on holiday, sometimes going four or five days between motions, and it’s often painful. Prune juice helps but I can’t always get it abroad. Do you have any suggestions? Constipation means different things to different people: a problem depends on what is ‘normal’ for the patient. There is no standard set frequency to go and there is huge variation among all adults.